Established in Singapore in 1983, Esmé Parish Silver has showrooms in Singapore, Paris and Hong Kong, having turned a hobby into a thriving business. 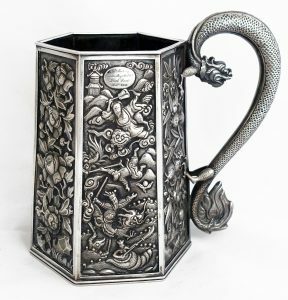 The gallery specialises in Chinese and Japanese Export Silver created in the 19th and early 20th centuries mainly for the Western market and has recently added Indian antique silver to its collection. Esmé Parish Silver also has a wide range of English antique silver, from Georgian and Victorian through to Art Nouveau and Art Deco.